Congress has funded the federal share of the Children’s Health Insurance Program throughout its 20-year history, but continued funding is in doubt this fall. The program covers more than 75,000 kids and pregnant women in Colorado. Colorado has options to keep these kids covered if federal funding goes away, but it could be expensive and difficult. The future of Colorado’s Child Health Plan Plus — or CHP+ — is uncertain. Federal funding for the program, which provides health coverage for 75,2541 children and pregnant women in Colorado, ends on September 30, unless Congress renews it. The debate about the future of the Affordable Care Act (ACA) has overshadowed this deadline and complicated the politics around it. Colorado is looking at different possibilities to keep these kids and pregnant women covered if federal funding is not reauthorized — including state options to continue covering them — options that could involve additional costs impact operations of other state programs. This brief, the first in a series of Colorado Health Institute (CHI) analyses on the future of CHP+ in Colorado, looks at the history of the program, enrollment trends and key questions that the state must consider going forward. Congress passed the State Children’s Health Insurance Program — now widely known as CHIP — in 1997 as a bipartisan response after efforts by the Clinton Administration to reform the health care system were rebuffed. CHIP covers children and pregnant women in low-income families who earn too much to qualify for Medicaid. CHIP is a partnership between states and the federal government. The program was set to expire in 2007, but the Bush Administration temporarily reauthorized it for two years. Since then, Congress has revisited — and debated — the program and its funding about every two years. Congress passed the Child Health Insurance Program Reauthorization Act (CHIPRA) in 2009, which reauthorized the law and expanded CHIP to immigrant children who live legally in the country. In 2010, the Affordable Care Act (ACA) extended CHIP funding through 2015.3 The program’s funding was extended again in 2015 through the Medicare Access and CHIP Reauthorization Act (MACRA). Numbers: There are several ways to count CHP+ enrollment. HCPF’s most recent figures show 75,254 children and pregnant women were enrolled in CHP+ as of July 2017. This is a point-in-time number, and it is smaller than other published figures that reflect the number of people enrolled in CHP+ at any time during a year. Finally, the graphic on page 2 tracks yearly enrollment — the average number enrolled over the course of a year. This number is smaller than the point-in-time number. Names: The federal program is called the State Children’s Health Insurance Program, abbreviated as CHIP. In Colorado, federal CHIP funding pays for the state Child Health Plan Plus, or CHP+. CHIP gave states the choice to create a separate program or to expand their Medicaid programs to include newly eligible children and pregnant women. In 1998, Colorado was one of the first states to pursue CHIP, creating its own separate program, called CHP+. Policymakers reasoned that a separate program could build on efforts pursued in Colorado in the mid-1990s to create a children’s health insurance program. In 2009, the Colorado legislature passed HB09-1293, which created the Hospital Provider Fee and increased the income eligibility for CHP+ from 205 percent of the federal poverty level (FPL) to 250 percent FPL, or about $61,500 for a family of four in 2017. The latest major change to the program came in 2011 when legislators passed SB11-008, standardizing program eligibility for all children under the age of 19 and making more Colorado kids eligible for Medicaid.8 When the law was implemented, the state shifted a portion of children who were previously covered by CHP+ into Medicaid while retaining the enhanced federal match rate for these children. The federal match means that for every $100 spent on a child or pregnant woman in Colorado, the federal government pays $88 — leaving the state to cover a balance of $12. CHP+ is intended for children and pregnant women whose household incomes are above the Medicaid threshold, but below 265 percent FPL.9 As of July 2017, CHP+ covered 75,254 kids and women in Colorado. 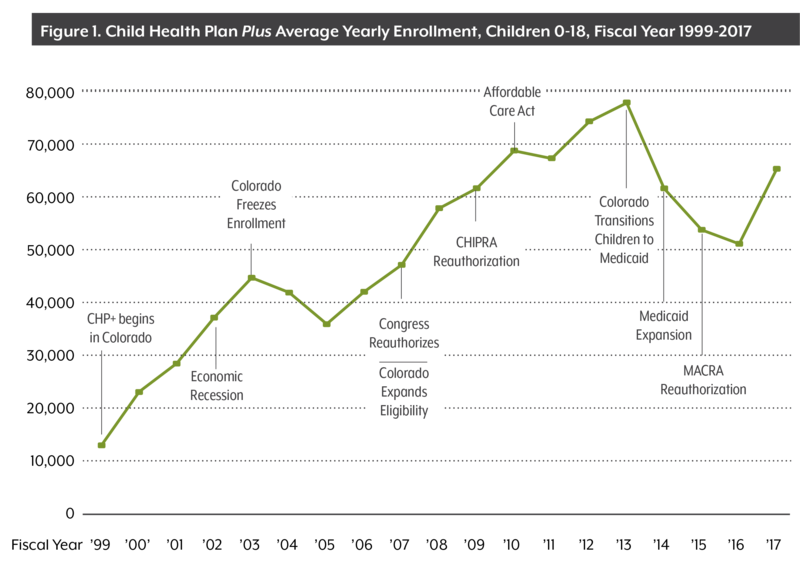 CHP+ has helped push Colorado’s uninsured rate for children to a historic low of 2.5 percent in 2015, an important success story. Chaffee County leads the pack with 11 percent of children enrolled in CHP+. Close by are Kit Carson and Ouray both with 10 percent enrollment. On the other hand, Costilla County’s CHP+ enrollment is lowest in the state at 1 percent — followed by Douglas with 2 percent of children enrolled. (See Figure 2). Congress has between September 2017 and February 2018 — when many states are anticipated to deplete their CHIP reserves — to decide on the future of the program. State officials who will need to come up with plans on the future of CHIP face that same timetable. CHI has identified three significant policy implications that state policymakers should consider moving forward. Any of the options mentioned above will require significant operational and administrative changes to existing systems that determine eligibility, enrollment and billing. What would these options cost the state? The CHP+ program accounts for about 1.4 percent of HCPF’s total $9 billion budget.14, 15 Making decisions as funding for the future unfolds could increase administrative or medical costs to the state. Congress’s decisions in September will impact Colorado on multiple levels: Costs resulting from changes in funding, continuity of care for current CHP+ enrollees, and administrative or operational impacts will influence Colorado’s “next steps.” Transitioning kids and pregnant women to any other form of insurance, including Medicaid or Colorado’s marketplace, could change their care provider, how much families spend on care, or if they continue to have coverage. CHI will continue to follow this as decisions are made. This is the first brief in a series of analyses that will expand on CHIP in Colorado. Visit the Department of Health Care Policy and Financing's web page on the future of CHP+. 11 CHI calculated the percentages displayed in Figure 3. Denominator: Colorado Department of Local Affairs. (2016). “Population by Single Year of Age - County.” Numerator: Colorado Department of Health Care Policy and Financing (2017). “CHP+ Enrollment by County, CY2016.” Provided by special request to the Colorado Health Institute.